As the back to school shopping commences, it’s time again for Security Home Mortgage’s annual Client Appreciation Party at Seven Peaks Waterpark! We are having it a little earlier this year to ensure that the weather is warmer and nobody needs to rush home to get homework done. Watch for your family’s ticket in the mail over the next several days. The fun happens August 7th from 5-9 PM! Yesterday the Fed renewed their view that inflation threats continue to moderate, and reiterated their plan to sell much of their bond assets. I expect interest rates to continue along this same track for the next few months. With my parents coming into town last night and Monday being Pioneer Day, I am trying to stretch this upcoming weekend into a four day celebration by working extra hard today. Hence the early delivery of this week’s commentary. Stock indices hit more all-time-highs yesterday, and yet, interest rates haven’t seemed to notice. Typically, interest rates rise with the stock market. But the more the free market relies on sovereign intervention as normalcy, the more that pattern is disrupted, making it increasingly difficult to forecast with any degree of accuracy the future of interest rates. That challenge is not localized to my tiny office either; faced with the challenge to liquidate $4 trillion in marketable securities, even the Federal Reserve Banks seem to be scratching their heads as to how and when to pull the drain plug. It could be as early as September, but it might not be? Across the pond, the European Central Bank President is facing similar circumstances. Mr. Draghi commented this morning that in spite of a strengthening economy, prices have flat-lined, requiring a continuing period of “highly accomodative” interest rates. So for now, we consumers continue to benefit from cheap financing. Inflation, as determined by how much we consumers pay for the stuff we buy, is only up 1.7% from this time last year. That’s well under the 2.0% target that regulators are hoping for and should help keep rates in the same range. It’s the slowest consumer price growth in almost a year and is due in large part to the cheap cost of fuel. The total receipts received from retail stores across the country dropped -0.2% last month, which is not all that alarming, considering that most people are spending their paychecks on summer vacations. Speaking of summer vacations, it’s also prime moving season while the kids are out of school. My kids start back up in only five weeks. So if you’ve been putting off selling to get a few projects done, you are burning daylight–as it were (now that the days are getting shorter). Yesterday, Janet Yellen said that the economy was strong enough to warrant the “winding down” of its 4.6 trillion dollar balance sheet. The Fed’s neutral policy and mild enough inflation seem to make everyone happy. 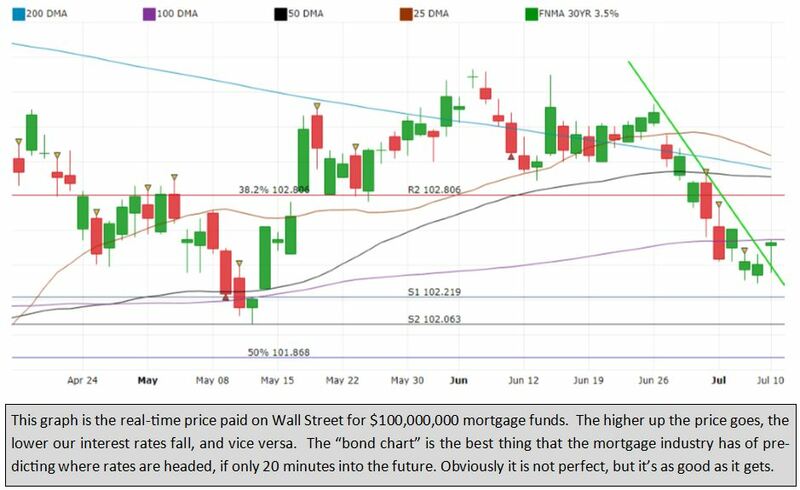 Investors and traders just shrugged their shoulders and went back to work, resulting in stocks and bonds both positive trading sessions yesterday. Ms. Yellen addresses the Senate today: no reaction yet. The Producer Price Index released this morning was weaker than expectations, dropping from 2.1% to 1.9% annual growth. Stocks are up and Bonds are down, both only moderately. Interest rates look to have hit a ceiling of resistance–and pricing a floor of support–this morning. There are no meaningful reports out today or tomorrow. Let’s see if rates will turn around. There are seven million people in this country who are officially “unemployed”. The Unemployment Rate ratcheted up a tenth to 4.4% this morning, even though the BLS Jobs Report shows that there were 43,000 more jobs created than had been expected. That seems erroneous at first glance until you see that 361,000 people entered the workforce but only 245,000 jobs were created. Now look at the same report which shows that 69% of men and 57% of women who are eligible to be employed are actually in the workforce. That’s an average Labor Participation Rate of 62.8%, which is well under what the headline 95.6% “Employment” rate might make you believe. The difference between the Unemployment Rate and the Labor Force Participation Rate is complicated, but boils down to whether that person really wants to be working or not. Those of us who are working average $26.25 per hour and put in 34.5 hours per week. That keeps wage-based inflation steady at a 2.5% year-over-year growth rate. After starting to slide upward for no apparent reason over the last ten days, hopefully interest rates will settle back down now that the confusing but uneventful Jobs Report is behind us. Newly created jobs, as measured by the ADP Payrolls came in at 158K, less than the 180K expected. Though still at historic lows, Initial Jobless claims rose to 248K. These two factors should help rates improve, but the market is spooked. The 10 Year has broken above 2.385% and has room to grow. Rates across the boards are trending upward. Again, there is no apparent reason for the uptick in interest rates, other than the market driving itself–like a Tesla, or whatever this pictured car is. Kind of scary.